Our Belize all inclusive wedding package makes it easy for you to say "I Do" on a beautiful private island. 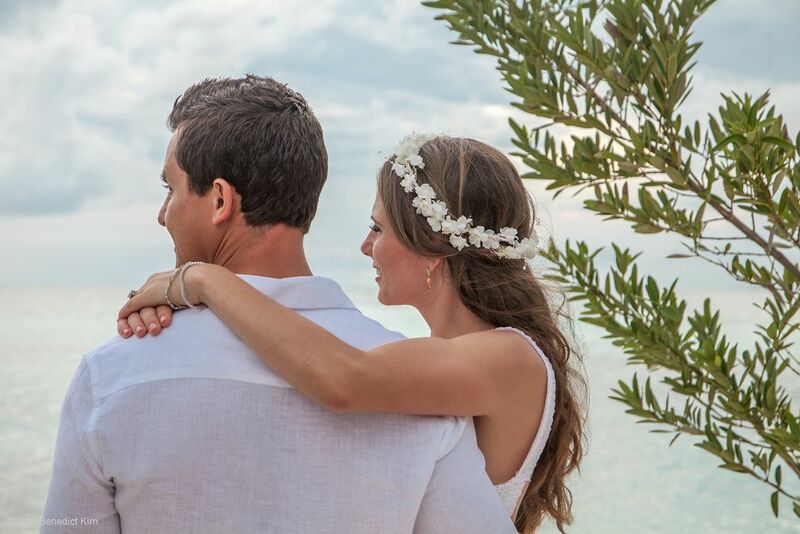 If you've dreamed of walking down the aisle with your loved one on a secluded beach at sunset with the sea gently lapping in the background, then let us plan your flawless beach wedding. 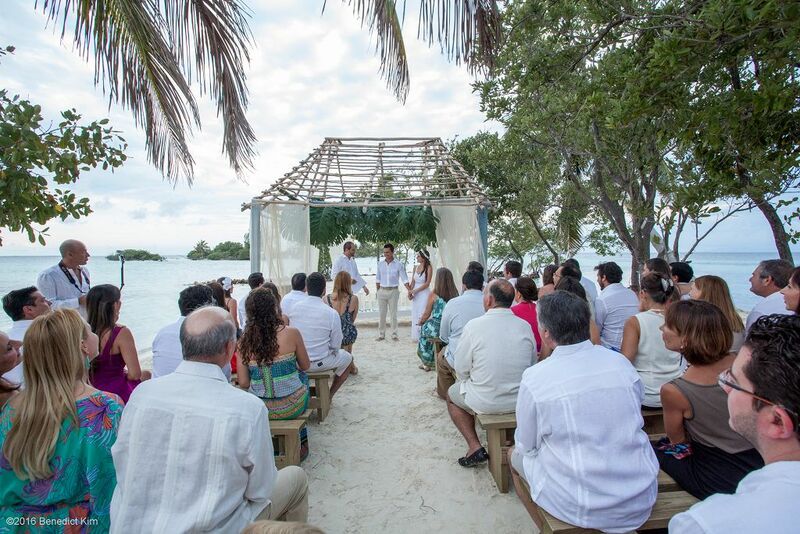 Pledge your love to each other as you're surrounded by gorgeous crystal aquamarine waters on a sun-kissed, white sand beach with balmy tropical breezes. Our romantic ambiance makes Coco Plum a unique and intimate location for your destination wedding. 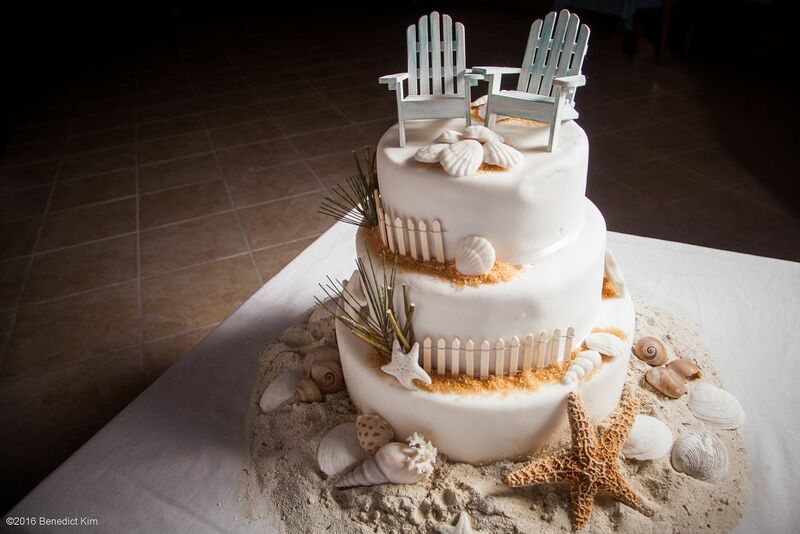 Our all inclusive beach wedding package is the perfect foundation for creating the wedding of your dreams including tropical floral arrangements, photography & videography, cake and a bottle of champagne to celebrate, as well as all licensing and officiant fees. Finer details and personalized wedding services can also be arranged by selecting from our various à la carte options essentially creating a customized destination wedding package. 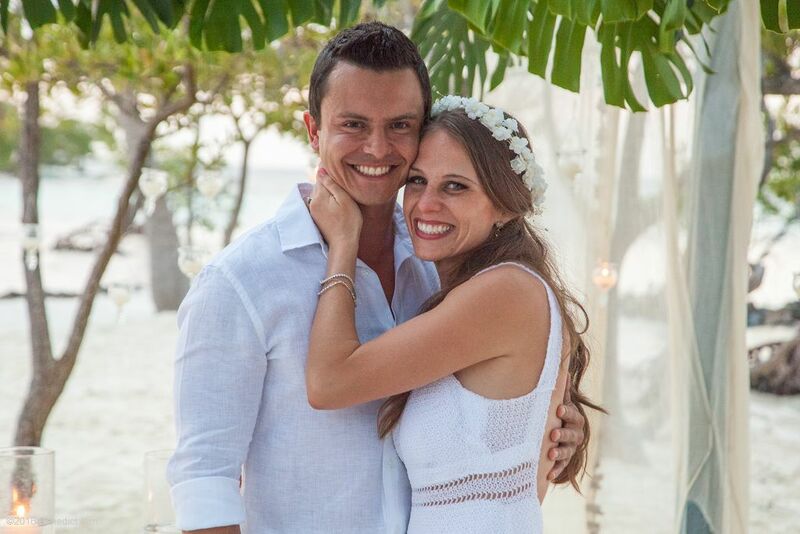 From seating and cocktail hours, to music and more, Coco Plum offers the wedding of a lifetime. Plan your dream wedding today! 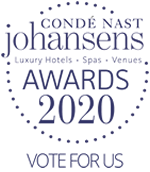 Note: Rate does not include accommodations. Minimum stay for the wedding package is seven nights. Check out our Honeymoon Package to book your stay. 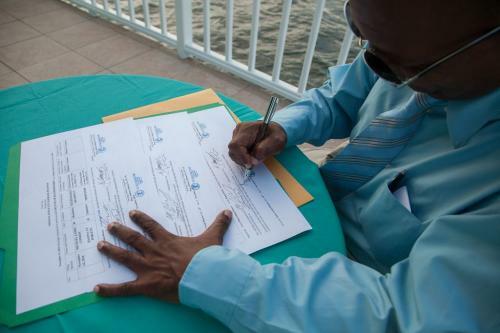 Belizean marriage is legal everywhere in the world. Belize welcomes couples with very few requirements and getting married in Belize is a straightforward process. Our wedding team will help you with all legal requirements. After celebrating your wedding, it’s time for the real relaxation to begin as you enjoy your romantic honeymoon in an exotic locale. 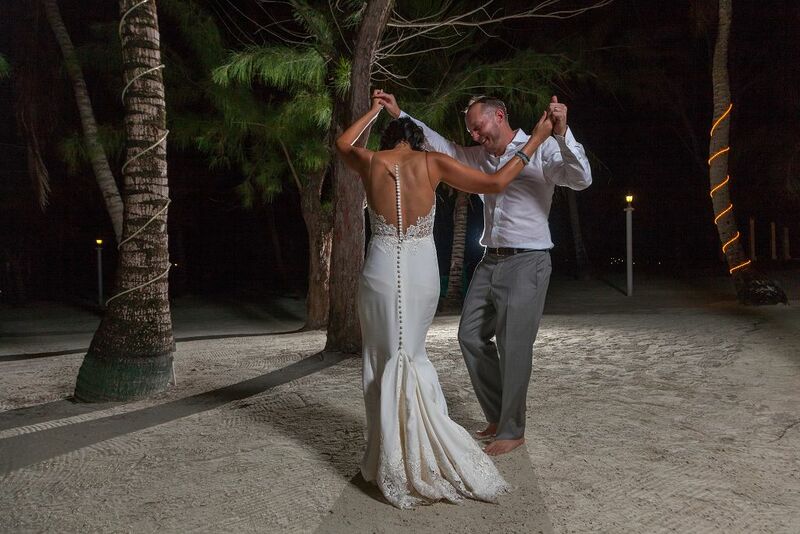 Everything is taken care of with our All Inclusive Honeymoon Package including: local air and land transfers, air conditioned oceanfront cabana accommodations, all meals and unlimited local alcoholic drinks, extra romantic touches, guided adventure tours, all taxes and park entrance fees. 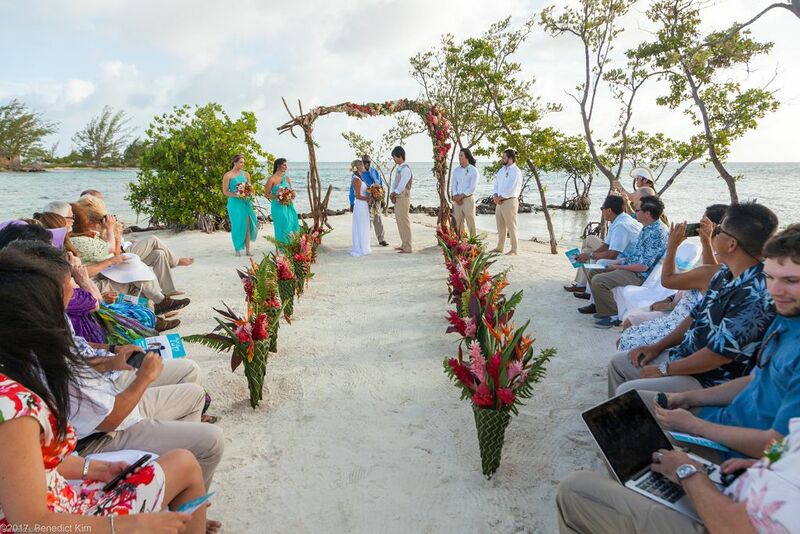 Planning a Belize destination wedding with family and friends? Our private island can comfortably accommodate up to 42 persons. When inviting your family and friends, we’ll offer a special group rate. Once the wedding couple has booked, we’ll provide a booking code, which can be issued to all wedding guests. They can contact us to book separately and reference the unique booking code to apply the special rate. 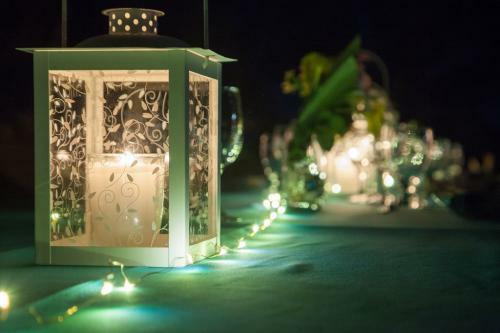 Customized décor options such as chair coverings, unique centerpieces, extra bouquets, larger cake, etc. À la carte wedding services and special requests are available at an applicable fee. 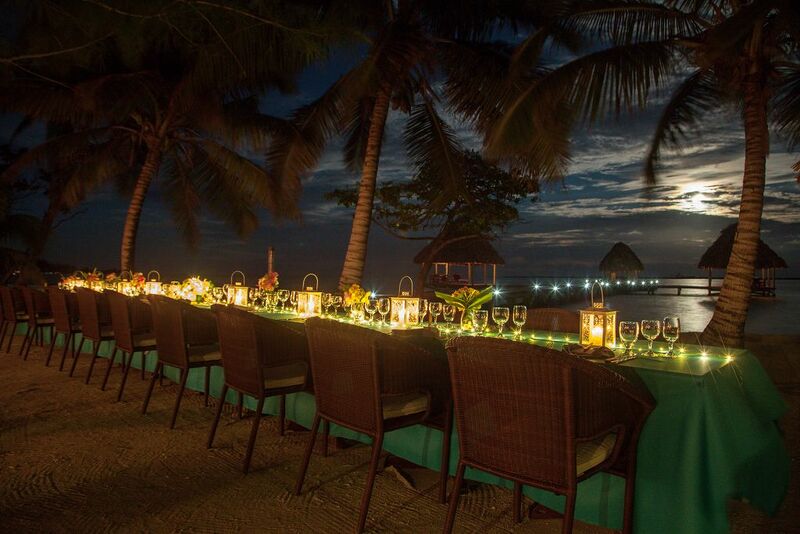 Contact us today to customize your Belize wedding package! Kindly note: this does not include the cost of your accommodations. Ask us about adding a Honeymoon Package. Please call us at (800) 763-7360 to book the Wedding Package. Alternately, you can contact our Reservation Team for a personalized rate quote. transfers. For more information regarding our accommodations, tours, and meals please see our All Inclusive Honeymoon Package. 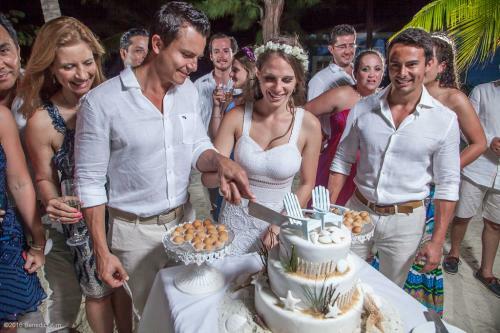 We do not work with independent wedding planners. 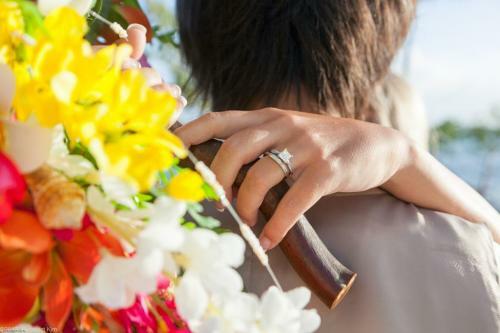 Internal wedding planners are at your disposal. 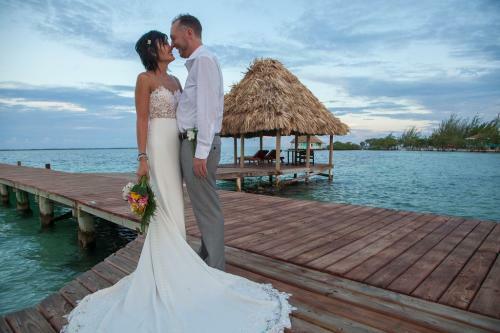 A minimum stay of seven nights is required with purchase of the Belize Wedding Packages. If you will be accompanied by a wedding party, we recommend that you reserve accommodations at least six months in advance of your stay. Wedding guests should book a minimum of four nights stay with us. Please review our Getting Married in Belize Requirements. Price includes all taxes and only the above listed amenities. 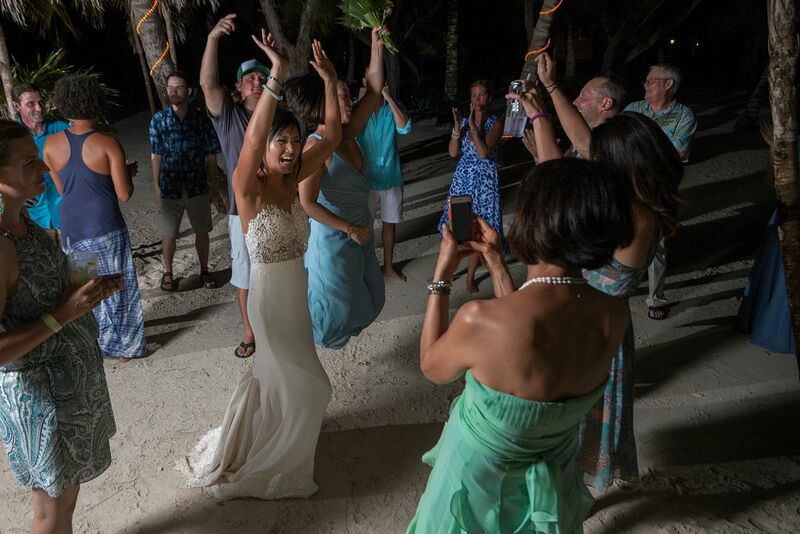 For additional requests, such as DJ, live band, chairs, bottles of champagne, or a reception dinner for wedding guests, please contact us and we will be happy to customize a Belize wedding package for you. Rate does not apply for wedding island rentals. Please contact us for a personalized Island Wedding quote. Can my friends and family attend? 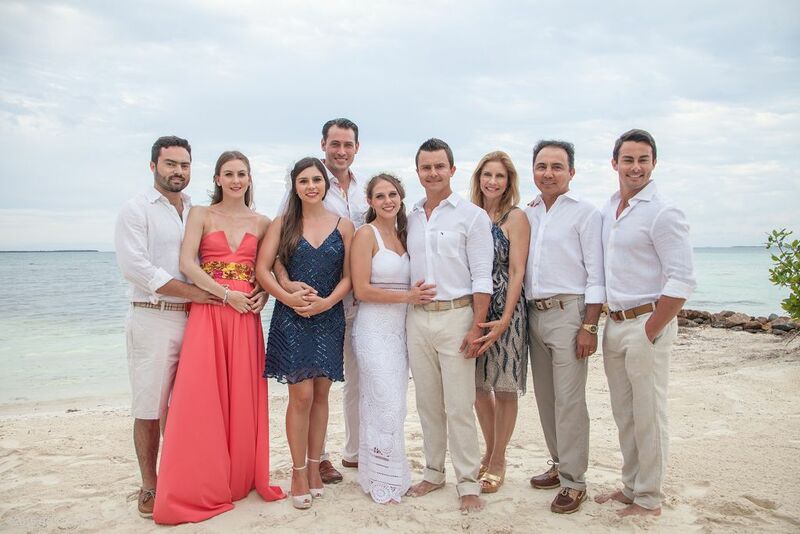 If your guests join you, then they have the option of also purchasing one of our worry free all inclusive packages. Guest are required to book a minimum of a 4 night stay. As we are an adult only resort, we would not be able to host your wedding party if it will include persons under the age of 18 years. We surely can accommodate them, however, if you book the Private Island Rental Package. What is the maximum number of persons your resort can accommodate? Our resort's maximum occupancy is 60 persons. We require a 32 person minimum to book the Private Island Rental Package. Is there any group rate that we would be entitled to? 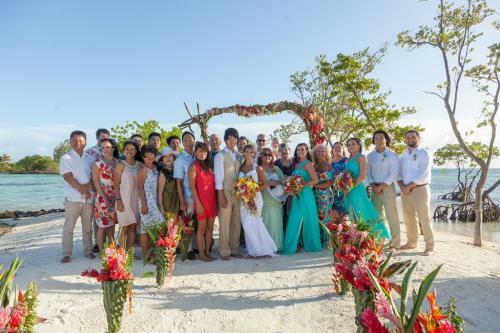 If your wedding party will exceed 10 persons and will not include persons under the age of 18, there is a special group rate that we can offer you. Once the wedding couple has booked, we will provide you with a booking code which you can issue to your guests. Your guest must reference the booking code at the time of booking to be eligible for the special rate. What if my guests are not staying at Coco Plum Resort? If you have any guests that will stay on the mainland, we will need to transport them no later than 5:00pm back to the mainland. For the safety of all our guests, and given the uncertainty of the weather we cannot guarantee a boat transfer after dark. As such, it would be best for your wedding guests to stay at our resort. Can you tell me more about your accommodations? 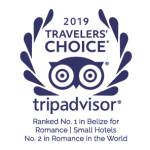 Coco Plum features: standard, suite style, and premium suite style cabanas, as well as one three bedroom overwater villa, all with spacious balconies. Each cabana has a king sized bed — the suite style & premium suite style also have a sofa bed. Can you give me an overview of the ceremony and dinner? 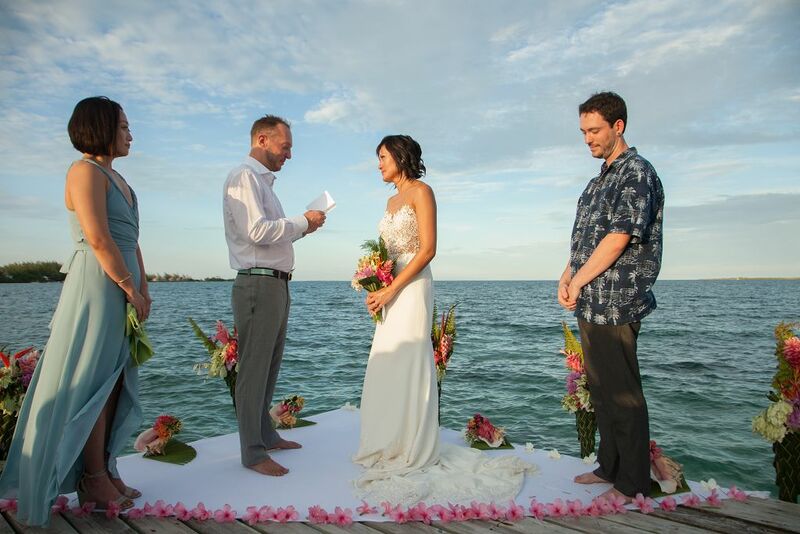 As it pertains to the details of the wedding, most couples choose to have their ceremony around sunset. Depending on the time of the year, this is generally somewhere between 4:30 and 6:00pm. The ceremony lasts about 15-20 minutes. 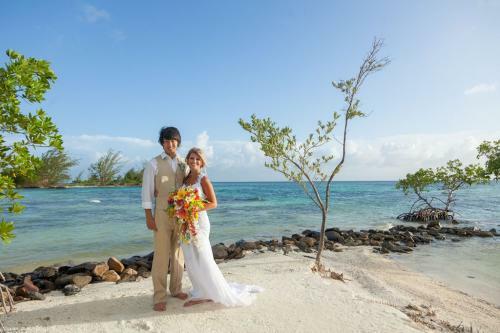 There are several locations guests can choose from for their ceremony and reception. The island manager or guest services manager will show you these options upon arrival. He will let you know all the pros and cons and you can see for yourself the location. You will then choose your locations, and you leave the rest to us! We offer a daily bar snack at 4pm, so for our wedding ceremonies we typically push this back a little after the ceremony, so that guests can utilize it for a cocktail hour while they continue taking pictures before dinner. The dinner menu for our guests' special day is surf and turf. Lobster, conch and shrimp are 3 options in the meal, but this can vary as these are all seasonal delicacies. If you would like anything other than the options listed for the reception dinner, then just let us know and we can confirm if there are any additional costs. We do offer an after dinner snack which is served at around 10pm. This can also be added for a small fee of $15* per person. Again, if you would like anything specific, let us know and we can verify the cost. 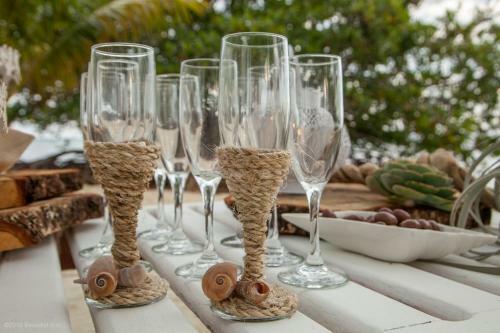 In regards to the toast, the basic wedding package includes only one bottle of champagne. Additional bottles can be purchased prior or on your arrival for your guests. Several all inclusive packages include an unlimited local alcoholic beverage portion. So your guests will have no worries as it pertains to drinks. 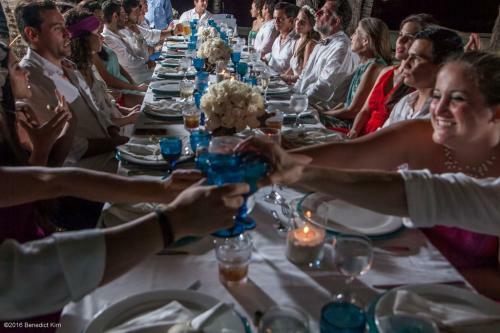 If you were to do the Island Rental, again all guests would get the unlimited local alcoholic beverage portion. You can also add a DJ or a band for the reception. Contact us at contact@cocoplumcay.com for those fees. The photographer in the package will only cover the ceremony. So if you would like to book him for an extended period there will be an additional cost based on the time. There is also an option to use an alternate photographer, who can also be booked for an extended period. We also offer chair, table and linen rentals for the reception. We can also upgrade the number of tropical flowers in the wedding package if you would like floral centerpieces for your reception. *These rates are subject to change at the time of booking. "Coco Plum is a place for romance, for new friendships, for great food, and for indescribable natural beauty. The facilities and staff are simply top notch. In short, I cannot recommend Coco Plum highly enough. Truly the best of its kind."